Coventry-based RDM Group had a surprise visitor to their display earlier today at celebrations held to mark the 50th birthday of Milton Keynes. 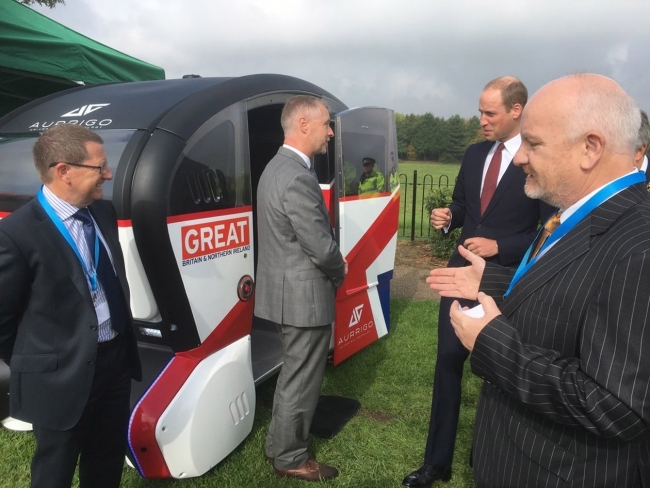 The Duke of Cambridge made a beeline to the firm’s driverless Pod that will shortly be commencing trials on the streets of the town as part of the UK Autodrive initiative into testing ‘first and last mile transport solutions’. He met with Sales and Marketing Director Miles Garner, who showed him around the four-seater pod that is fitted with the company’s own autonomous control system and travels 60 miles on one charge and can do a maximum speed of 15mph. Prince William also took the opportunity to sit in the driverless vehicle and enquired about where the UK sat in relation to the rest of the world with this technology. “This is a major honour for us and the first time we have ever had Royalty in our pods,” explained Miles Garner. Initial trials of the pods are due to begin in pedestrianised areas of Milton Keynes later this year, with up to 40 pods set to be deployed across the town centre by the end of the project next summer. UK Autodrive will also be trialling autonomous and connected road-based cars on the streets of both Milton Keynes and Coventry.